Until you become a mother, you never quite realize the sacrifices you’re willing to make for your family. For these two moms, that commitment means doing what’s necessary to take care of their little ones. You may have heard people talk about diaper need in the news lately, but what exactly does that mean? Simply put, diaper need is not having enough diapers to keep your baby clean, dry and healthy. Evidence shows that not having enough diapers stresses moms more than anything else, including not having enough food or a stable place to live. The two moms profiled here are very different, but they share a common thread: They both know what it’s like to manage the delicate balancing act of keeping their babies happy and healthy while juggling other personal responsibilities. 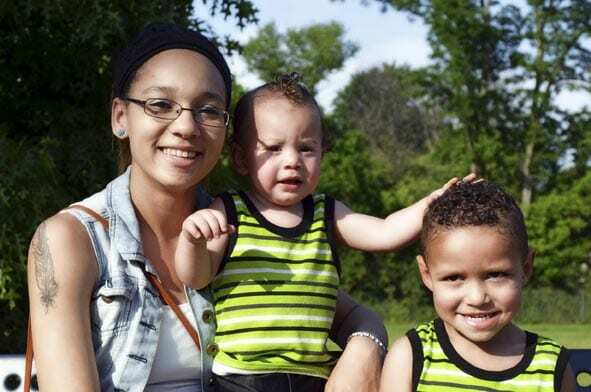 “I felt like a failure as a mother because I couldn’t provide such a basic necessity for my son,” says mom Chanelle Hensler (pictured above with Z’amir and Da’Marko), speaking of her experience with diaper need. She has one son of her own, Z’amir (1), and a godson, Da’Marko (3), who she has raised since he was only 3 weeks old. “They are why I work so hard, and they have shown me how strong I truly am as a mother,” she says. Originally from Nashville, Chanelle attended high school in Front Royal, VA, before moving to Ashburn, VA, to be with Z’amir’s father. When they broke up, she and the boys came to Arlington, VA, where she participates in a program that provides safe housing and educational opportunities for young mothers. Chanelle is right: Her story reflects that of the 1 in 3 families struggling to afford enough diapers. The executive director of Chanelle’s housing program presented her with the opportunity to invoke real change by connecting her to Congressman Keith Ellison, a representative from Minnesota who is passionate about improving the lives of low-income families. 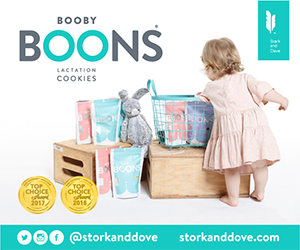 “I told him my story, and we spoke about my troubles of getting diapers and how diaper banks have made it so that I don’t have to choose between going to school and providing for my children,” she says. “He’s very understanding and is really trying to make a difference.” After their first phone meeting, Rep. Ellison hosted Chanelle, Da’Marko, and Z’amir at his office in Washington, DC, where he offered her a huge opportunity to have her voice heard: an internship in his office. “Obviously, I took it!” she says excitedly. Hailing from Ivory Coast, Marina fell in love with an American man who was an international teacher in Africa. The pair were married and lived abroad in Mexico and Colombia, among other places, before settling in the United States. They welcomed their first child, Patrick, and it wasn’t long before Marina felt the stresses of raising a little one in a foreign land. She and her husband experienced financial troubles, and the marriage began to crumble beneath the weight of it all. As she thought about how to take care of her kids and best use her skills, including a college degree in marketing and strong work ethic, Marina earned money by doing odd jobs. 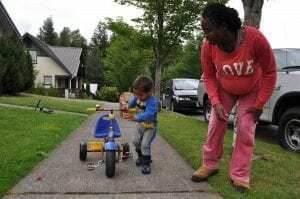 She was also able to secure financial assistance with rent and some bills, and getting diapers, wipes, and food from Eastside Baby Corner in Issaquah, WA, allowed her to save her earnings to start her own business. “I started cooking for people in the neighborhood and delivering meals,” she says. Marina’s days typically start at 4:30 a.m., when her fiancé comes home from the graveyard shift and she goes to work at a daycare. When she returns at 8 a.m. and the kids are off to school, she starts cooking.